Starship Mario is a Mario-head-shaped planet and spacecraft in Super Mario Galaxy 2 that is used to travel across the universe. Although notably smaller than the previous games' hub areas, it serves as the hub of the game and has, more or less, replaced the Comet Observatory from the first game. Other than its smaller size, another difference from the Observatory is that it also has changing backgrounds, the appearance of which depends on the World that it is currently in. A flock of seagulls can be seen on and around Starship Mario in the first two worlds, as well as the final world. Starship Mario is able to access different worlds by traveling through Portals between them. In the World 2 background, planets that resemble Saturn can be seen. While on the ship, Mario is able to explore and interact with various non-playable characters, including Lubba and the Co-Star Luma. Some other characters in the game appear after certain Power Stars are collected or a specific goal is met. Much like Delfino Plaza from Super Mario Sunshine, Mario can ride Yoshi here. The egg which contains him is located on the "nose" of the ship, having been obtained after rescuing Yoshi in the Yoshi Star Galaxy. A small circular platform floating just above Starship Mario has many berries, and three Boards that will advise the player on how to control Yoshi. If the player eats all of the berries on this small platform, they will get a 1-Up Mushroom. There is also a room under the area with the pressure switch which can only be accessed by jumping into a large chimney which leads into the room, or by going through a secret door in the bill of the ship's "cap". The room contains a large ball of light similar to the Beacon in the Comet Observatory, a telescope and some books. There are also several platforms near the edge of the room which later become display cases. 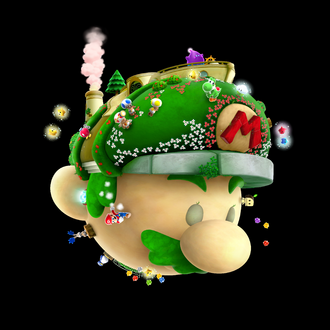 Various power-ups, such as the Fire Flower and Rock Mushroom, begin to appear on display after they are used to obtain certain Power Stars over the course of the game. However, the display cases cannot be penetrated and thus the power-ups inside cannot be used. A usable Cloud Flower does appear in front of the ship's wheel after Mario has completed "Climbing the Cloudy Tower" in the Starshine Beach Galaxy, however. This is the only power-up that can actually be used onboard Starship Mario. The Toad Brigade's Starshroom also stays close to the ship. Transfer between the two ships is possible via a Warp Pad located in the ship's right ear. After Mario collects his first Power Star, he finds himself on a rocky meteor-battered planetoid. It is captained by Lubba, who commands a crew of Lumas. After beholding the Power Star, and seeing Baby Luma's trust in Mario, he strikes a deal with Mario and hands the ship over to him, reshaping it to look like Mario's head for as long as he continues to collect Power Stars (though it actually remains this way for the remainder of the game). The ship's main purpose, though, is to allow Mario to travel between and select galaxies to visit. To leave the ship and go to the world map, one must step up to a ship's wheel near the top, in front of which is a small weight-activated button. When pressed, the button sends the player to the World Map, from which they can select galaxies to visit. If the game was turned off, then the player instead will go to the Grand World Map from which the player can select Worlds to visit. If the player wishes to return to Starship Mario without visiting a galaxy, they must position Starship Mario over an empty point on the World Map and then select it, which will bring up the option to return. Mario will also automatically return to the ship if he receives a Game Over at any point during gameplay. This is a significant difference from the first game, in which Mario would return to the title screen after a Game Over. Mario and the Co-Star Luma inside the Engine Room of Starship Mario. Cloud Flower - Complete "Search for the Toad Brigade Captain" in the Fluffy Bluff Galaxy. Rock Mushroom - Complete "Rock and Rollodillo" in the Boulder Bowl Galaxy. Spring Mushroom - Complete "Spring into the Chompworks" in the Chompworks Galaxy. Spin Drill - Complete "Silver Stars Down Deep" in the Spin-Dig Galaxy. Bee Mushroom - Complete "The Sweetest Silver Stars" in the Honeyhop Galaxy. Boo Mushroom - Complete "Haunting the Howling Tower" in the Boo Moon Galaxy. Fire Flower - Complete "Burning Upside Dizzy" in the Upside Dizzy Galaxy. Many of the passengers that visit Starship Mario will appear on the back of the ship's head. As Mario continues to explore the universe, he meets various creatures and friends. After certain missions have been completed, they appear on the ship. All creatures stand on tree stumps on the surface of Starship Mario except for the Toad Brigade, who resides on the Starshroom (accessed via a Warp Pad in Starship Mario's right ear), two Lumalees which sell Chance Cubes for coins and Star Bits (accessed via a Warp Pipe in Starship Mario's left ear), and Luigi, who resides in a small door towards the top back of Starship Mario, and will switch places with Mario at any point after he has defeated Bowser for the first time. Below is a full list of every character that makes an appearance on Starship Mario, as well as the conditions that must be met before they will appear. All non-playable characters make an appearance on Starship Mario, with the exception of Coach, Penguru, Piantas, Princess Peach, and The Chimp. Lubba - At start of game. 5 Yellow, 2 Blue, and 1 Red Lumas - At start of game. Co-Star Luma - At start of game (it is slightly larger than the playable one). Hungry Luma - Call to Starship Mario in Worlds 1 - S.
Yoshi - Complete "Saddle Up with Yoshi" in the Yoshi Star Galaxy. Luigi - Collect 3 Power Stars in World 3. Finish the game by collecting 70 Power Stars and defeating Bowser in the Bowser's Galaxy Generator. Boards - Some at start of game, others after Yoshi appears. Toad Brigade - Complete "Digga-Leg's Planet" in the Spin-Dig Galaxy. Banktoad - Collect seven Power Stars. Mailtoad - Collect thirteen Power Stars. Lumalee (1 Chance Cube) - Collect any one normal or hidden Power Star in World 3. Lumalee (5 Chance Cubes) - Complete "The Magnificent Magma Sea" in the Melty Monster Galaxy. Green Luma 1 - Complete "Throwback Throwdown" in the Boss Blitz Galaxy. Green Luma 2 - Collect 120 Power Stars. Honeybee - Complete "The Secret Wall Jump" in the Honeybloom Galaxy. Star Bunny - Complete "Think Before You Shake" in the Flip-Swap Galaxy. Jibberjay - Complete "Jungle Fluzzard Race" in the Wild Glide Galaxy. Penguin - Complete "Exploring the Cosmic Cavern" in the Cosmic Cove Galaxy. Whittle - Complete "Tall Trunk's Big Slide" in the Tall Trunk Galaxy. Gold Gearmo - Complete "C'mere, Goomba" in the Boulder Bowl Galaxy. Silver Gearmo - Complete "C'mere, Topman" in the Space Storm Galaxy. Bob-omb Buddy - Complete "Return of the Whomp King" in the Throwback Galaxy. Rosalina - Complete "The Perfect Run" in the Grandmaster Galaxy. The Totals Sign as it appears on Starship Mario. After Mario has collected sixteen Power Stars, a light blue glowing signpost appears directly to the left of Starship Mario's wheel. This sign lists all of the Power Stars and Comet Medals that Mario has currently collected, as well as the galaxies that have been unlocked thus far (and whether the galaxies have been completed or not). This sign is used to help the player keep track of how many stars they have at any various point in the game. The same information can also be accessed by clicking the "Star List" button on the pause menu at any time during gameplay. The Starship Mario reappears as a default board in Fortune Street. On the Mario Galaxy stage in Super Smash Bros. for Wii U and Super Smash Bros. Ultimate, the Starship Mario can be seen above the main stage in the background. Lubba can also be seen on board, as well as several other Lumas. It also appears as a trophy. However, it is removed from the stage in 8-Player Smash, alongside Bowser's Airship and the Starshroom. The Starship Mario also appears as an Advanced-class support spirit in Super Smash Bros. Ultimate, using its artwork from Super Mario Galaxy 2. When equipped, it increases the fighter's jump height. In World of Light, the Starship Mario spirit is encountered in the outer space region, north-east on the Light Realm map, on the path leading to Falco's battle. To earn the spirit, the player has to beat a Giant Mario on the Mario Galaxy stage. Starship Mario flying in World 1. Starship Mario before it was reshaped to resemble Mario's head. Mario standing aboard the bridge of Starship Mario. Starship Mario positioned over World 2. Starship Mario exploring World 3. Starship Mario in Fortune Street. Starship Mario in Super Smash Bros. for Wii U. "A spaceship in the shape of Mario. He likes to zoom around the galaxy in it." Wii Super Mario Galaxy 2 This ship was made for Mario by Lubba, head honcho of the Luma crew. It's fueled by Power Stars, so the more Mario collects, the deeper he can go into space. Also, as he continues his adventure, the ship will fill up with new friends and items from all over the universe. At some point, a Yoshi's Egg will even appear on the ship's nose! An early screenshot of Super Mario Galaxy 2, showing a different-looking Mario head planet. Yoshiaki Koizumi wanted to include "a platform that was a planet shaped like a head", in the first game, but it didn't make the cut. Also, in early screenshots for Super Mario Galaxy 2, a much different planet shaped like Mario's head is shown, looking more similar to the actual Mario than the final one, but being smaller. Whenever the player selects a galaxy to fly to from the World Map, Starship Mario will turn to look at Mario as he flies to the galaxy. On the cover of Super Mario Galaxy 2, a Question Block and a Goomba both appear on Starship Mario, even though neither of these things ever appear on Starship Mario in the actual game. Also, the Warp Pipe has been repositioned, as it now appears higher up on Starship Mario's cap, as opposed to in Starship Mario's left ear. Much like the Comet Observatory, Starship Mario's music adds more instruments as Mario progresses through the various worlds. Also in Fortune Street, Wario references Super Mario Land 2: 6 Golden Coins by saying "If I flip the "M" on that ship upside down, it'll all be mine!". This page was last edited on March 1, 2019, at 11:49.